The air was still, the heat oppressive. It was my first day back in Arches NP after living and working on the cool of the 6000-foot mesa that comprises Island in the Sky, Canyonlands NP. I was sticky, sweaty, and ready to hike somewhere away from people. It’s a mystery how I managed two seasons here without ever getting to Tapestry Arch. This lovely span is not on the park map, and visitors rarely find their way to it. PERFECT. Just my kind of hike. I would do trail monitoring — repair cairns, erase social trails, put up juniper log barriers to stop off-trail traffic. 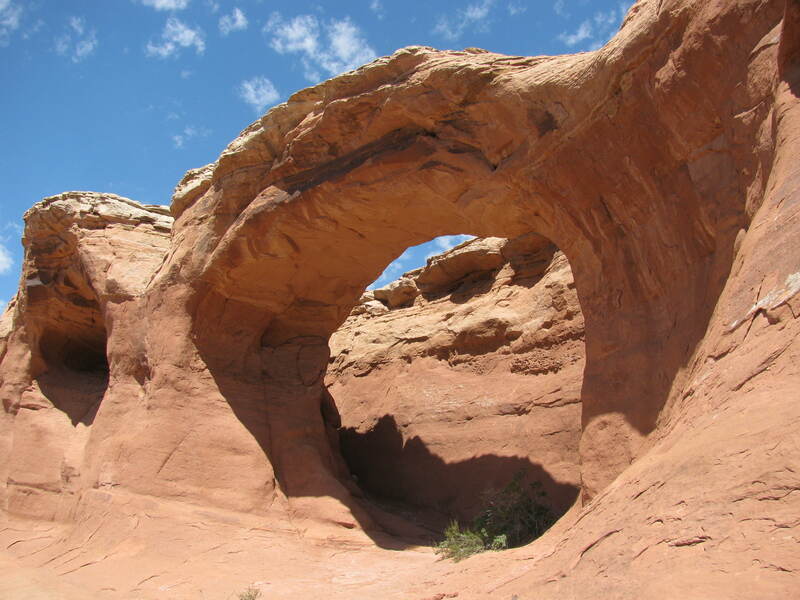 The desert was as silent as I have ever heard it as I made my way to the shade underneath the arch and shed my sticky backpack. Water — that’s what my body craved. I sat in the cool of the massive rock beam overhead and drank a half liter, and then just sat and listened, and sat and thought, and sat and watched, and sat just to sit. And, after a little while, a new sound began to make itself known in my ears. Putting two fingers to my wrist, I compared it to my pulse; it was a perfect match. It was my heartbeat. My heartbeat! The desert was so silent that I could now hear my own blood flowing through my veins. Now THAT is quiet. Welcome to my desert world.